Can You Eat Expired Mayonnaise? Is Mayonnaise That Has Been Frozen Safe to Eat? 1 What Happens if You Freeze Mayonnaise? 2 What Happens When Eggs Freeze? 4 Can You Eat Expired Mayonnaise? Mayonnaise is an emulsification of eggs, oil and an acidic ingredient such as vinegar or lemon juice that generally lasts only a few days in the refrigerator when made fresh or several weeks when you purchase packaged mayonnaise. Freezer storage can keep mayonnaise from going bad. While the mayonnaise is safe to eat after freezing, it might separate and lose some texture. Frozen and re-thawed mayo is safe to eat, but it might separate and become unpalatable. Take steps to reduce separation or add water to re-emulsify after freezing. While you can freeze mayonnaise and it will hold its original form while frozen, the emulsion is likely to break as it thaws. The eggs, oil and vinegar or lemon juice separate, which results in liquid at the top of the mayonnaise. Packaged mayonnaise is usually stabilized to extend its shelf life, so separation won't be as severe. You can still use the mayonnaise, but you must either pour off the liquid or attempt to re-emulsify the ingredients. Do not expect the thawed mayonnaise to be the same as it was before freezing. Mayonnaise on sandwiches does not freeze well, although it doesn't make the sandwich unsafe to eat. The liquids that separate make the bread soggy, which can ruin a perfectly good sandwich. The mayonnaise is already spread on the bread, so there's no way to even attempt emulsifying the separated ingredients. The best option is to freeze the sandwich without mayonnaise and add the mayonnaise after the bread and other ingredients thaw. Mayonnaise freezes best in salads and casseroles in which the mayonnaise is already distributed among other ingredients. While separation occurs just as with freezing plain mayonnaise and mayonnaise on sandwiches, you can stir the thawed salad or casserole to reincorporate the mayonnaise. The results won't be exactly the same as when made fresh, but the taste and texture will be close. Don't attempt to freeze lettuce-based salads because the lettuce and other vegetables wilt or become soggy. Freezing works best with foods such as tuna salad or chicken salad. When stored securely in freezer-bag packaging, they can stay safely frozen for up to two months. 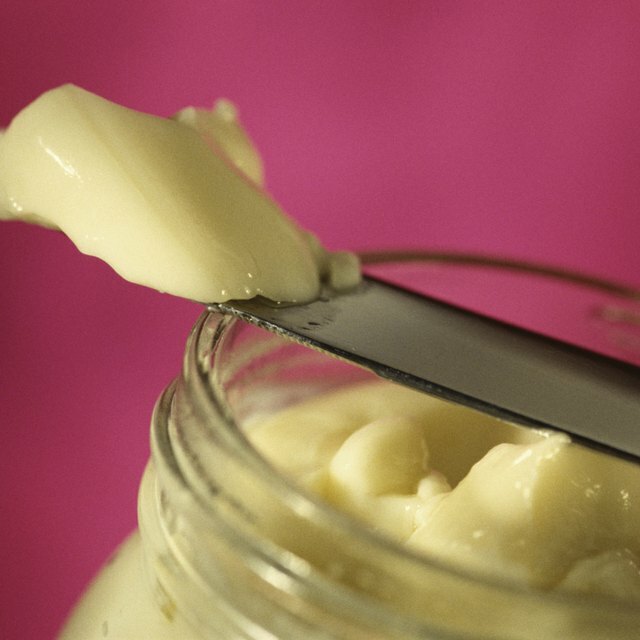 When making fresh mayonnaise from scratch, there is no way to ensure you will achieve a perfect emulsion because the emulsion often breaks in the process. Given the difficulty of making fresh mayonnaise, attempting to re-emulsify thawed mayonnaise is more of a gamble than a sure bet, but it's worth a try. Add the thawed mayonnaise to a mixing bowl and whip it on high speed with an electric mixer to reincorporate the separated ingredients. If the ingredients don't emulsify well on their own, add water 1 tablespoon at a time to help bring them together. The resulting mayonnaise will be thinner than its original state. Is It Dangerous to Leave a Sandwich With Mayo on It Out for Several Hours?